Tallyn's Reach was designed to meet the needs of the homeowners. The Homestead clubhouse is available for rent for homeowner events. Rental forms can be filled out and submitted online. Please click on the link on the FORMS tab to complete your rental request and save your date. Interested in using the community pool? Please complete the Pool Use Form on the FORMS tab to ensure all those living in your home have access to the pool throughout pool season. It is important to remember that homeowners wishing to use the pool must be current on paying all District fees. Looking for options to be active nearly year round? A map of the tennis courts, parks and trails can be found by clicking on HELPFUL LINKS. The tennis courts are available for use year round, unless there is snow on the ground. 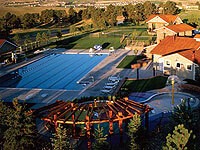 Parks and Trails are available in various locations throughout the community. We hope to see you out and about enjoying all that Tallyn’s Reach has to offer.